PROCEED THROUGH THE FIRST TRAFFIC LIGHT & BEAR LEFT INTO THE PARKING GARAGE – PARKING IS FREE! As you are proceeding through the first traffic light, you will see the Wang Center ahead on the right side. After parking in the garage, walk across the pedestrian mall into the main entrance of the Wang Center. The admissions table will be just inside the doors on the right. 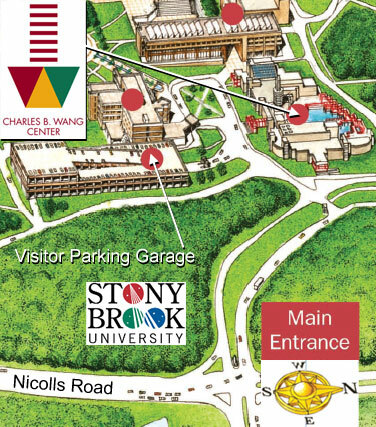 Take Exit 62; Nicolls Road North (Suffolk CR 97), continue to Stony Brook University Main Entrance, turn left and follow signs. Take Exit 51; Nicolls Road North (Suffolk CR 97), continue to Stony Brook University Main Entrance, turn left and follow signs.